This week we’ve put one of our top-selling product ranges under the spotlight, looking at the appearance, features and benefits of the keyless entry door locks in the range and identifying some applications where the locks are suitable for use. The CL5000 push-button door locks are popular for their ability to provide a range of different electronic functions. Locks in the CL5000 range are the largest of all our products. 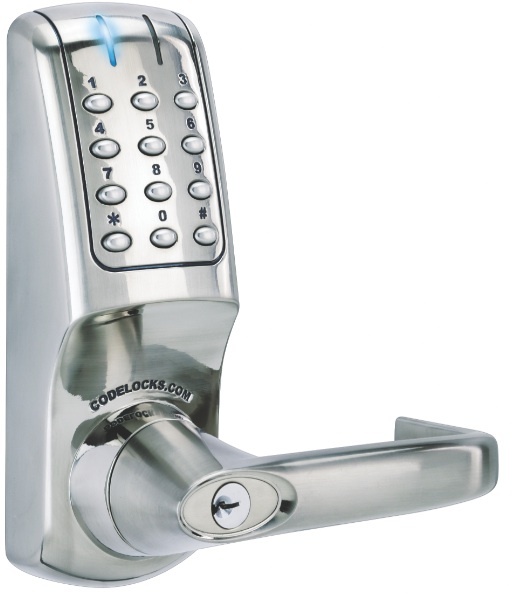 This is because the electronic locks boast a conventional 3×4 button keypad – a layout instantly familiar to users. With robust full-size lever handles, these heavy-duty locks are suitable for environments where high numbers of people need to gain access through a door. The appearance is stylish and contemporary in design; most of the locks in the CL5000 range are available in either brushed steel or polished brass. To keep the locks looking good, they are coated with a physical vapour deposition (PVD) finish, making them resistant against the weather and therefore suitable for use on external doors. There are two main products in the CL5000 range. The CL5010 is an electronic tubular mortice latch lock, available with a keypad on one or both sides of the door. The CL5020 is an electronic euro profile mortice latch lock with a double cylinder to control the deadbolt and to retract the latch bolt. Locks in the CL5000 range do not have to be taken off the door for the access codes to be changed. The ability to programme the lock in situ avoids the disruption of having the door out of use for any length of time. As well as being convenient, this can also represent a significant time saving, especially in buildings where there are lots of digital locks to maintain. The keypad locks have a high number of possible user-code permutations available, making them suitable for applications in large buildings, like hospitals, schools, universities or offices where many user codes need to be issued. Management of the codes is via the keypad, where they can be deleted, suspended or restored using a master code. Having access through the keypad negates the need for users to carry a key. However, certain staff members, like maintenance staff, often need access to all areas and remembering the codes for every single digital lock may be tricky, especially if there are lots of them. The CL5000 range features a key override facility that can help in this situation. Rather than having to remember all the codes, maintenance staff can access the lock manually with a key. As an option, locks in the CL5000 range can also be ‘keyed alike’, so that maintenance employees need only carry one key to access all the locks in a building. There is also a ‘panic access’ kit available for digital locks in the CL5000 range. This is ideal for external doors where access needs to be controlled on the outside, and where there is an escape push bar on the inside. This kit is popular for use with digital locks on emergency exit doors in hospitals, care homes and hotels. Here is feedback from one customer using digital door locks from the CL5000 range. The CL5000 locks givs us peace of mind with regards to access control within the new theatre buildings. The new locks are easy for staff members to use and restrict the level of access to the public. We are extremely pleased with the locks and are grateful to Codelocks for their support. Kathryn Beale, The Watermill Theatre, Newbury. For detailed product specifications, installation and programming guides for coded locks in the CL5000 range, visit our website or call 0800 393405.